Best 3 Games with…Modular Board! One of the best ways to make a game have tons of replayability is to have a modular board. When looking for games with a modular board I tried to stay away from games that have you exploring….taking a tile as you play and placing it on the map in the middle of the table. I already did a Best 3 with that mechanism. For modular boards, I focused more on games that already have the entire board on the table before you start and then you play each game based on the new layout of the board. I really like this mechanism, when done right. The great thing about modular boards is it makes the game scale extremely well. 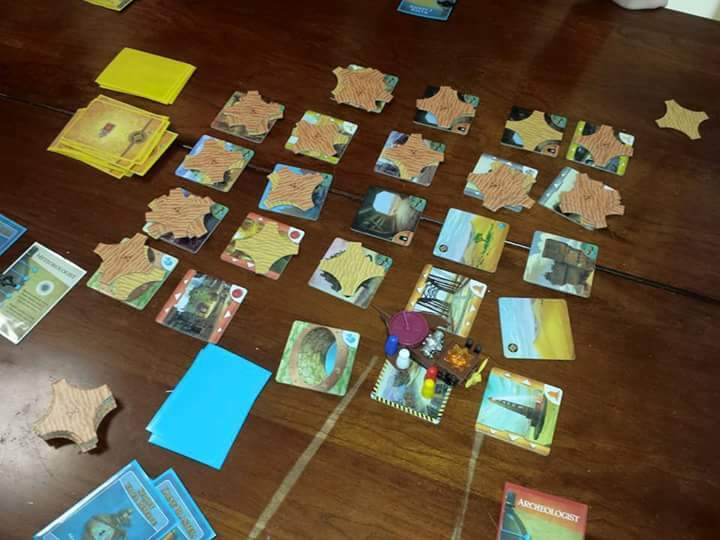 When you have an already printed board, many times a two player game is much more relaxed and open. You basically do what ever you want whenever you want to. Then you play the four player game and it feels way to tight and you can’t do anything. Modular boards allow you to shrink or expand the board making it perfect for the right amount of people. You get the exact same feeling each time you play even though there are different player counts. Here we go with the Best 3 Games with…Modular Boards! I love Matt Leacock’s family co-op game Forbidden Desert. My family plays it often and I have convinced two other families to buy it after they played it with us. Apart from the individual player powers…..coming soon to a Best 3 near you….the modular board is fantastic! The modular board in this game is hidden for most of the game. The tiles represent different areas of a hidden city in the middle of a desert. You and your group are trying to fix a ship left by the inhabitants of this city. While you move and reveal areas, some might have a part to the ship. You need to find the parts and get to the launch pad before someone dies or the storm gets too strong. The great part about this board is that everything changes from game to game. The parts, launchpad, and wells are not in the same place every time. It is a great way to make the game different and exciting each time. Victory really depends on where tiles are placed. It seems so simple but it is so right! Quantum is that perfect example of scaling well with multiple player counts. Many other games could be here, including Deus and Forbidden Stars (which I have not played yet). Quantum has a great modular board design from Eric Zimmerman. 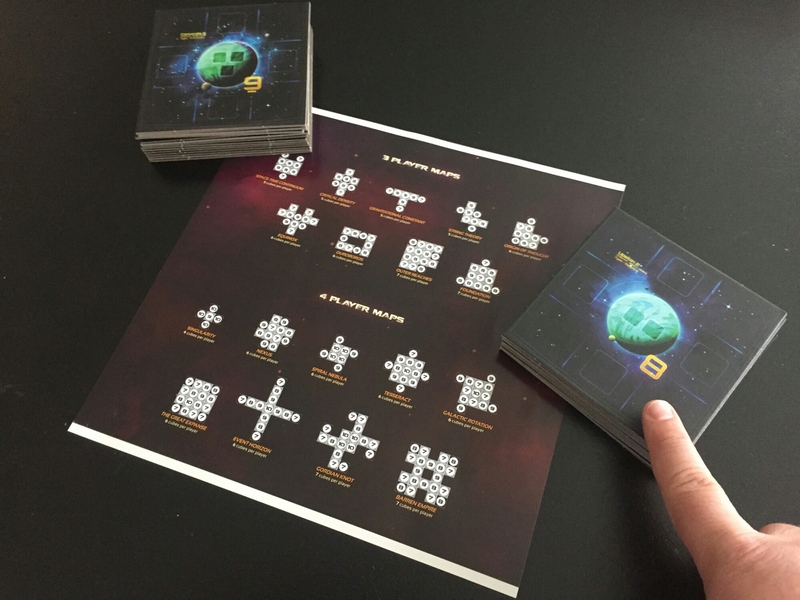 The game board is made of different square tiles that are made of planets. Each planet has a number associated with it and a number of spots available for your Quantum Cubes. The person who places a certain amount of Quantum Cubes first, determined by the number of players, is the winner. You have a certain amount of tiles to place out for different player counts. The game even comes with 30 different board designs, 10 for each player count. Not only that but you can just make up your own and play that. Each time you set this game up the strategy will change. Some ships powers will be more beneficial than others depending on the map layout. The modular board design from Quantum should be in more games period! This is the gold standard, the quintessential, the Ludicrous Speed, the end all be all of modular boards. It just doesn’t get better than this. I know…I know….it is the same as Command and Colors and Memoir ’44, they did it first…..yes! Richard Borg does it better with this. Everything about this modular board is spectacular. One, the scenario cards. Choosing your own scenario and deciding how you want to earn victory points is awesome! Two, each scenario has a different way to set up your side of the board….that’s right your side. The other side will be determined on what the other player will choose. It will tell you where hills, cities, forests, water and even victory points will be located. There are so many ways the board will be set each time and your goals will change with it. Think that’s it??? Nope….you also get to place your army and Camps where you want also. You can put your Camp on the map to give the other player another target. When you place your units on the board they can be placed in different areas each time. Placing your camp will even change the layout and strategy. Trying to figure out what your opponent is trying to do and placing your units to prevent him or help yourself is a struggle. The game is just great at changing the battlefield each time you play to making it different, unique and awesome! Did you ever try Warcraft: The Board Game? It really needs the expansion though to make it awesome, partly to remove the resource die to just straightforward resource collection and the vast improvements made to the card decks that become your source for magic spells and battles. I have not tried or even heard of Warcraft the board game. I will check it out. Fantasy Flight Games did that a number of years ago. To me Battle Lore clearly looks like a spiritual successor, no doubt they learned a lot from that experience and applied it. Warcraft: The Boardgame has meeples rather than minis but they’re well crafted and suitable to the game considering your units change as they upgrade.